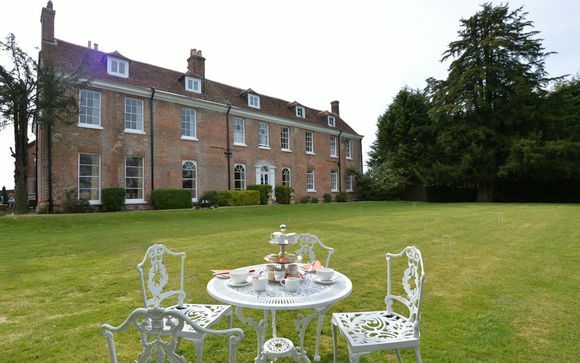 This striking hotel is nestled within the New Forest National Park with breathtaking wildlife and scenery. Feel like royalty as you stay in this former royal hunting lodge which was once a favourite haunt of Charles II. Nestled in beautiful woodland, there are breathtaking walks and cycle paths on the hotel’s doorstep...its a nature lovers paradise! With typical - accidental - English irony the New Forest is anything but new: it was first proclaimed a royal hunting preserve in 1079. It's also not much of a forest, being mostly heathland ('forest' is actually from the Old French for 'hunting ground'). Designated a national park in 2005, the forest's combined charms make it a joy to explore. Wild ponies graze on pretty scrubland, deer jump in the distance and rare birds flit among the foliage. Here you will find a myriad of genteel villages dot the landscape, connected by a web of walking and cycling trails. Relax, explore or just enjoy, the New Forest is the ideal location for everyone. As you admire the timeless scenery it’s easy to see why it’s such a popular holiday beauty spot. 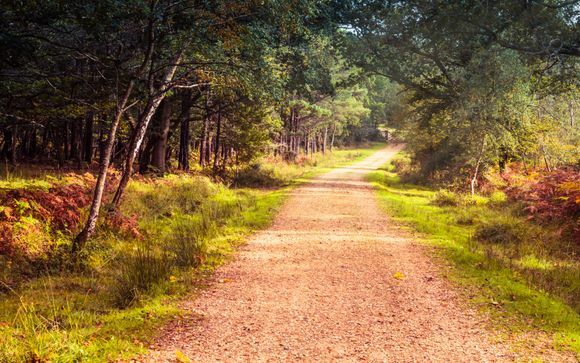 There is a wealth of places to visit and explore in the New Forest, from award winning gardens, to museums and wildlife parks. Each season provides a change of scenery, from the rich deep colours of spring and summer to the seasons of mists and mellow fruitfulness. From royal hunting lodge to relaxing country retreat, this hotel is steeped in history and as you walk from room to room you can spy characterful features that date back to it's time as King Charles II's favourite hunting lodge: fireplaces, a coat of arms, and acorn and oak-leaf patterned doors all create a sense of history that has been expertly combined with modern twists. Located in an old hunting lodge formerly frequented by Charles II, this spa allows you to enjoy all the benefits of a good pampering while simultaneously taking in the beautiful countryside that surrounds it. - Small Classic Room (max. 2 persons): These cosy hideaways are mostly located in the eaves of the old manor and offer the ideal base from which to explore the forest. - Classic Room (max. 2 persons): Up in the eaves of the Manor Wing, these classic English country-style rooms offer a choice of twin or king size beds. - Country Classic Room (max. 3 persons): Located on the first floor of the Manor Wing, these king or twin-bedded rooms have high ceilings and beautiful sash windows overlooking the surrounding countryside. - Forest Room (max. 4 persons): These spacious Forest Rooms offer contemporary luxury in the impressive surroundings of a centuries-old building. - Manor Deluxe Room (max. 5 persons): With high ceilings and spectacular views across the grounds and parkland, these rooms offer a real sense of luxury. - Manor Deluxe Suite (max. 5 persons): The perfect option for larger families, these elegant Manor Deluxe Suites have a separate children’s room or living area. - Family Suite (max. 5 persons): Ideal for families with slightly older children, these rooms have a master bedroom with king size bed and a separate children’s room. - Muntjac Room (max. 6 persons): With far reaching views looking out over our gardens, Muntjac sleeps two adults and up to five children. - Sika Room (max. 4 persons): These light & airy attic rooms come with the luxury of a terrace that it shares with one other room overlooks the grounds and forest and is a great spot to enjoy a sunny day. - Roe Room (max. 3 persons): These large rooms feature a large double bed, piled high with pillows, a child's day bed and stylish furniture all underneath tall sloping ceilings and exposed wood beams. - Fallow Room (max. 3 persons): Featuring a king size bed and a child's day bed, an additional cot can also be place in the room. The room itself showcases stylish, contemporary furniture. Feast on venison from the New Forest or wild mushrooms from the local woods. 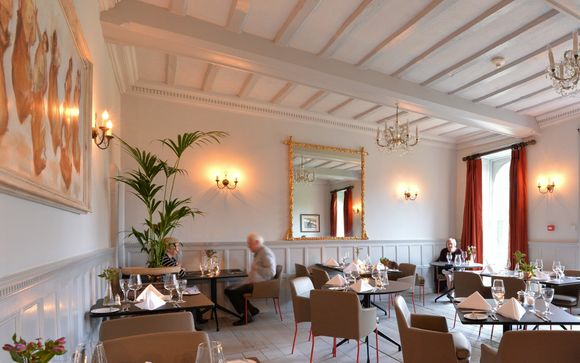 Savour fish freshly caught from the nearby coast and dishes flavoured with locally grown vegetables and herbs from the hotel's own gardens…The Stag Restaurant is a bright and modern space where simple cooking will fill you up. From mineral-rich muds to aromatic oils and an exceptional choice of massages, you are guaranteed to walk out of this award-winning spa feeling relaxed, nurtured and revitalised. 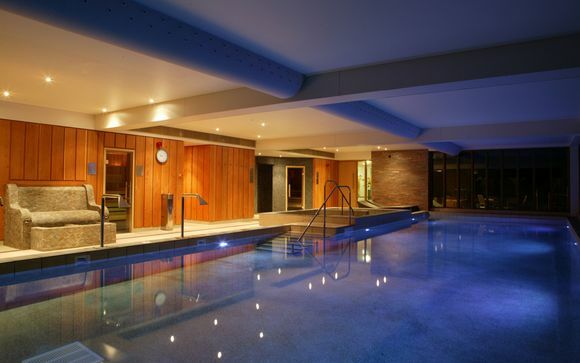 Let your stresses melt away with a refreshing dip in the hotel's pool where large windows offer a fantastic panoramic view of the forest, followed by a detoxing session in the sauna or maybe you'd prefer to simply relax in the Canadian hot tub with a glass of champagne and the sun dipping below the New Forest. Your hotel is approximately 5min / 2miles from Brockenhurst Station which is approximately 90 minutes from London Waterloo.